As promised in my post yesterday I mentioned I had a couple more button fairies but a little bit different. I learned to quill from a good friend Kathy a few years ago, I was always amazed at what she would send me with quilled ornaments, cards etc. Our Friendly Pallette group met for the first time (we all met online) in Ottawa Ontario almost 3 years ago. Kathy brought each of us a starter quilling kit and I jumped right on it. Vist Kathy's site here and see what kind of creations she does with quilling. I have not done a lot of quilling of late but I am getting edgy to get back into it. These wings I got from an idea, I had a few dragon flies I had made and set aside for cards and so I thought these would be great to make for my button fairies. I crimped the paper first then I made each individual wing then when the fairy was assembled I glued the wing pieces to the back and then flipped them over and put Stickles on the wings edges for that bit of shimmer. I loved how these turned out. I wonder where these will end up. Who knows.....but I can always hangthem and enjoy them myself if all else fails. And over at Inchy by Inch this weeks challenge is texture. I thought the tissue paper technique and painted and stamped paper towel would fall into this category. The background of the tissue has been sprayed with a gold shimmer and really adds a nice sparkle to this glamorous inchie. The green painted paper towel has some gold paint applied and a green flourish stamp. Well tonight is Stir Fry and I should go get a fire lit before the boy comes home from work. Stay tuned and have a great evening my blog friends. Beautiful inchies and great idea for texture. I love those button fairies they're so cute. 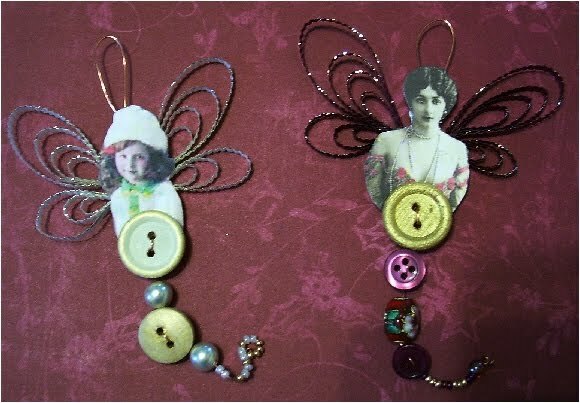 Wow, more fabby button fairies, great idea using the quilling for the wings. ...and the tissue and paper towel backgrounds are just perfect for the texture inchies. beeeutiful, Lesley! Love the fairies and the inchies. The backgrounds on the inchies really POP! Great idea to use the tissue paper - and gorgeous sparkly background! Oh I love your take on the button fairies. How do you make them? Is there a tutorial somewhere? Your inchies turned out super too. I'd say tissue is textural. I could see it in the photo. Love your new Christmas look for your blog.